a stam mishna – is attributed to Rabbi Meir. The following piece was recently emailed to me without attribution. I thought it was excellent and forwarded it to my email group. 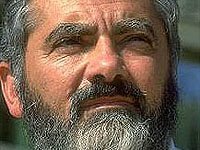 I have since had a number of messages saying its author was the late Rabbi Meir Kahane. Whatever reservations our people may have had about his tactics, his world-view was right on target. I understand that you are upset by us, about Israel. Indeed, it appears that you are quite upset, even angry. (Outraged?) Indeed, every few years you seem to become upset by us. Today, it is the "brutal repression of the Palestinians"; yesterday it was Lebanon; before that it was the bombing of the nuclear reactor in Baghdad and the Yom Kippur War and the Sinai Campaign. It appears that Jews who triumph and who, therefore, live, upset you most extraordinarily. Of course, dear world, long before there was an Israel, we - the Jewish People - upset you. We upset a German people who elected Hitler and upset an Austrian people who cheered his entry into Vienna and we upset a whole slew of Slavic nations - Poles, Slovaks, Lithuanians, Ukrainians, Russians, Hungarians and Romanians. And we go back a long, long way in the history of world upset. We Upset the Cossacks of Chmielnicki who massacred tens of thousands of us in 1648-49; we upset the Crusaders who, on their way to liberate the Holy Land, were so upset at Jews that they slaughtered untold numbers of us. For centuries, we upset a Roman Catholic Church that did its best to define our relationship through inquisitions, and we upset the arch-enemy of the Church, Martin Luther, who, in his call to burn the synagogues and the Jews Within them, showed an admirable Christian ecumenical spirit. And it is because we became so upset over upsetting you, dear world, that we decided to leave you - in a manner of speaking - and establish a Jewish State. The reasoning was that living in close contact with you, as resident-strangers in the various countries that comprise you, we upset you, irritate you and disturb you. What better notion, then, than to leave you (and thus love you) - and have you love us and so, we decided to come home - home to the same land we were driven out 1,900 years earlier by a Roman World that, apparently, we also upset. Alas, dear world, it appears that you are hard to please. Having left you and your pogroms and inquisitions and crusades and holocausts, having taken our leave of the general world to live alone in our own little state, we continue to upset you. You are upset that we repress the poor Palestinians. You are deeply angered over the fact that we do not give up the lands of 1967, which are clearly the obstacle to peace in the Middle East. Moscow is upset and Washington is upset. The "radical" Arabs are upset and the gentle Egyptian moderates are upset. Well, dear world, consider the reaction of a normal Jew from Israel. In 1920 and 1921 and 1929, there were no territories of 1967 to impede peace between Jews and Arabs. Indeed, there was no Jewish State to upset anybody. Nevertheless, the same oppressed and repressed Palestinians slaughtered tens of Jews in Jerusalem, Jaffa, Safed and Hebron. Indeed, 67 Jews were slaughtered one day in Hebron in 1929. Dear world, why did the Arabs - the Palestinians - massacre 67 Jews in one Day in 1929? Could it have been their anger over Israeli aggression in 1967? And why were 510 Jewish men, women and children slaughtered in Arab riots between 1936-39? Was it because Arabs were upset over 1967? And when you, dear world, proposed a UN Partition Plan in 1947 that would have created a "Palestinian State" alongside a tiny Israel and the Arabs cried "no" and went to war and killed 6,000 Jews - was that "upset" caused by the aggression of 1967? And, by the way, dear world, why did we not hear your cry of "upset" then? The poor Palestinians who today kill Jews with explosives and firebombs and stones are part of the same people who - when they had all the territories they now demand be given to them for their state - attempted to drive the Jewish state into the sea. The same twisted faces, the same hate, the same cry of "itbach-al-yahud" (Massacre the Jew!) that we hear and see today, were seen and heard then. The same people, the same dream - destroy Israel. What they failed to do yesterday, they dream of today, but we should not "repress" them. Dear world, you stood by during the holocaust and you stood by in 1948 as seven states launched a war that the Arab League proudly compared to the Mongol massacres. You stood by in 1967 as Nasser, wildly cheered by wild mobs in every Arab capital in the world, vowed to drive the Jews into the sea. And you would stand by tomorrow if Israel were facing extinction. And since we know that the Arabs-Palestinians dream daily of that extinction, we will do everything possible to remain alive in our own land. If that bothers you, dear world, well - think of how many times in the past you bothered us. In any event, dear world, if you are bothered by us, here is one Jew who could not care less.